" A model of trepidation is mentioned in rather cryptic terms in the Surya Siddhanta, a model first brought to the notice of European historians by Davis and Colebrooke. The [trepidation]amplitude oscillates between the limits + & - 27°, passing through zero in the year 3600 complete of the Kali yuga*. The rate is 54” per year (the year being the sidereal year as used in the Surya Siddhanta), and therefore the period of a complete cycle is 7200 years. " Compare the "Explicit" trepidation model with a more correct (and probably earlier) "Implicit" model of precession described below. * passing through the zero amplitude point after (each) 3600 years from the beginning of the Kali Yuga. 2) The Metonic cycle allows observation, every 19 years, of a lunar event which ruled over the beginning of Kaliyuga. - The lunar event is the conjunction of the new Moon (first crescent) with the star zeta Piscium ie the point zero of the Indian sidereal zodiac. It is mentioned in the Surya Siddhanta and it could be calculated by Aryabhata and his successors. In the following reasoning, we’ll use the Gregorian calendar to be able to compare distant events with a good accuracy. (the shift of this calendar with respect to the seasons is indeed very small). 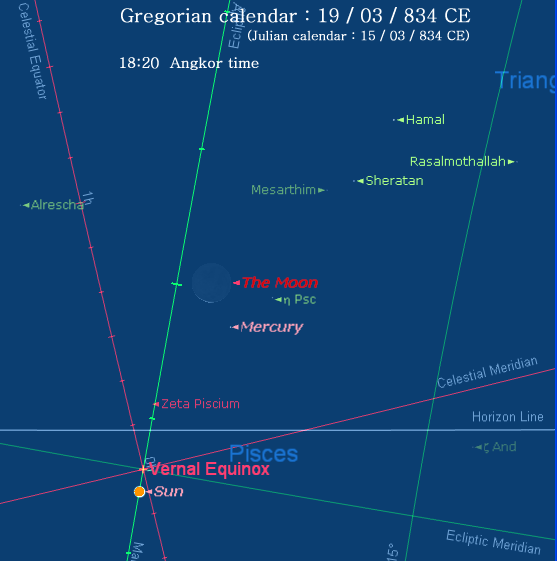 During the Khmer epoch, as zeta Piscium was near the vernal equinox, the conjunction of the new Moon with zeta Piscium was observed during March. At the beginning of Kaliyuga (3102 BCE), it occured in January but, according to the explicit model of precession (trepidation or libration) which was usually applied in this mythological context, it happened, by convention, in March (the trepidation model implies indeed that after 3600 years, the vernal equinox would have returned to the same day of the calendar as it was in 3102 BCE). During a period of some three centuries (ie with a precessional shift from 0 to 4°), a practical way to predict the dates of the conjunctions of Zeta Piscium with the new Moon was to use a Metonic cycle ie a period of 19 tropical years including 235 lunations (synodic periods of 29.53 days) after which the Moon's phases occur on the same date. In this case, the set of Metonic cycles could have begun on 19 / 03 / 834. Now, according to the EFEO archeologist Claude Jacques, the king Jayavarman II (blue insert here below), died in 834. We discovered that, during the Angkorian epoch, two important ceremonies were probably related to this Metonic cycle which began during the year of the death of Jayavarman II. 1) According to Claude Jacques (« Angkor, résidence des dieux ») the first pious work of Rajendravarman, after the Koh Ker interval, was the restoration of the Baksei Chamkrong temple. The new divinity of the sanctuary was consecrated, in the Gregorian calendar, on 28 / 02 / 948 CE around 09:40 ( 834 + 6x19 = 948 ). The divinity was a golden statue of Paramecvara. Now, "Paramecvara" is the posthumous name of Jayavarman II. We’ll see below why the inscription’s date is 20 days before the conjunction of the new Moon with zeta Piscium in the evening of 19 / 03 / 948. The age of the Moon (9.97 days) on 28 / 02 / 948 AD at 09:40 is relevant in the context of our study (see below). 2) Suryavarman II, the builder of Angkor Wat, was coronated on CE 1119 (834 + 15x19) , six years after the beginning of his reign. The coronation took place, as usual, at new year (ie the spring equinox), around the conjunction of the new Moon with zeta Piscium on 20 / 03 (13 / 03 Julian). Founder of the Khmer, or Cambodian, Empire and outstanding member of the series of rulers of the Angkor period (802–1431). Among Jayavarman II's accomplishments were the deification of the Cambodian monarchy, the establishment of the devarāja cult as the official state religion, and the reunification of the old kingdom of Chenla, which he expanded and formed into the Khmer Empire. Encyclopædia Britannica 2009 Ultimate Reference Suite. Chicago: Encyclopædia Britannica, 2009. Seven Metonic cycles after the new Moon of March 834 CE, on 19 / 03 / 967 CE (14 / 03 Julian), the new Moon set near zeta Piscium. That means that the planetary gathering of April 967 occured during a lunar month which began (7x19 years + 1 lunation) after the event of March 834 CE (depicted here above). It is worth remembering that any combination of integers allowing a calculation (from a remote conventional reference time) of the date of an exceptional planetary configuration was viewed by the astrologers as a sign of the gods. We noted previously, about the Baksei Chamkrong’s inscription, that the Moon’s age corresponding to 28 / 02 / 948 CE (23 / 02 Julian) at 09:40 was relevant in the context of our study. The age was indeed 9. 97 days at this moment. It was not very far from the age on 27 / 04 / 967 CE ( 22 / 04 Julian) at 23:57 ie 9. 81 days. We suggest it is not fortuitous. The goal was probably to indicate the predicted Moon’s age at the moment which, since the previous century, was the basis of the planetary diagrams drawn virtually across Cambodia. The oldest Saturn and Jupiter’s diagrams (22/04/967 CE) include two remote sacred heights - the promontory of Preah Vihear, in the Dangrek Range, and the Vat Phou Mountain, in present Laos - and two pre-Angkorian sites (Sambor Prei Kuk and Angkor Borei). This was possible by using some fortuitous configurations and, maybe, by creating voluntarily some small astronomical errors. We’ll show that, in the planetary diagrams, the Khmers located Jupiter at 0.5° from the true position they were probably able to calculate (see chapter 6-B). The later diagrams, using another date of reference (ie 15/04/967 CE) are the result of another method. The Khmers were indeed able to create some relationships between astronomical and geographical features by chosing a particular date. 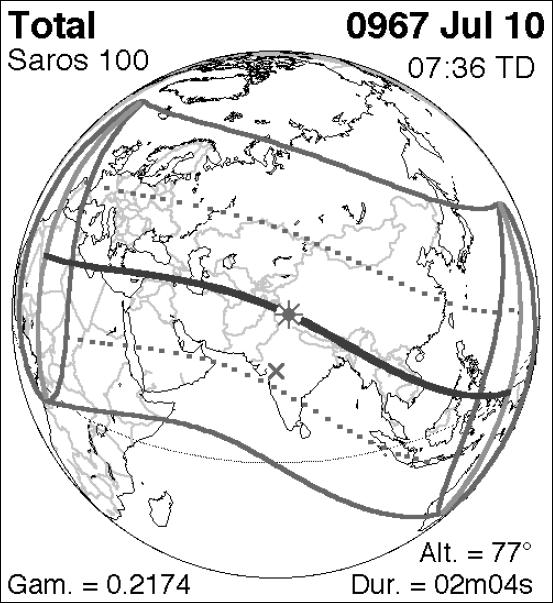 As the Sun was always located due East from the observer (religious tradition), it was possible to rotate the apsides lines by altering the date. This method explains The Angkorian sacred hill of Chau Srei Vibol, as seen from Phnom Bok, indicates indeed the apogee of the 15/04 Sun . The Ram, the Lion and the Archer are indeed, in the tropical zodiac, the « signs of Fire ». It was the first time the conjunctions of Jupiter and Saturn occured inside the triplex of «Fire » signs since the Khmer epoch. The triple conjunction of 967 CE occured indeed inside the tropical sign of the Ram (on the border of Aries and Pisces constellations). On 16/01/988 , the conjunction was observed at the end of the Archer sign and, on 07/03/1008, it appeared inside the Maiden sign (an « Earth » sign: the rule is not precise). The latter conjunction was triple. 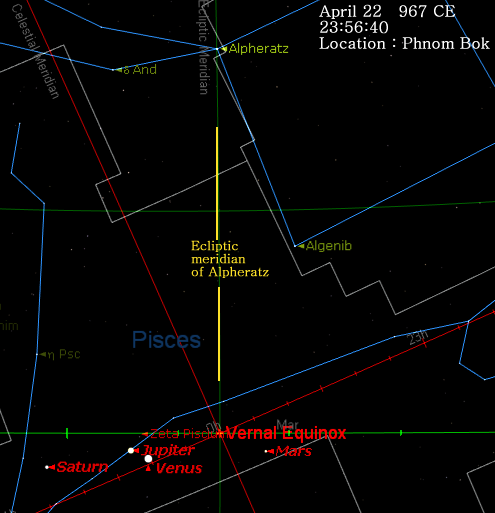 Finally, on 20/04/1027 CE (60 years after 967), the conjunction was watched again in the Ram sign. It is worth noting it occured at some degrees from the conjunction of 967 CE. Every 60 years, indeed, the longitude of the conjunction is shifted eastward (prograde motion). It comes back to the same sign after 794 or 795 years ( = one « J-S » period). It is worth noting the conjunction’s location does not cross the whole zodiac. It is shifted in the prograde direction (blue arrow) during some 13x60 years through more or less 120° (yellow zone). Then, after adding some 20 years, it comes back to the initial sector in the retrograde direction (red arrow). More precisely, the conjunction which was observed on 08/05/173 CE inside the Ram sign came back to the same sign during 967 CE, after 13x59.62 years + 19 years. Eight J-S periods befores 967 CE, during 5388 BCE (tables), the star zeta Piscium, the zero point of the Indian sidereal zodiac, was located at 7.96° from the winter solstice (longitude = 277.96°). We noted that, by using the precession’s rate of the Surya Siddhanta, the Khmers could have imagined that zeta Piscium was located precisely on the winter solstice during 5388 BCE (see calculation at left). In this case, the implicit (correct) model of precession of the Surya Sddhanta would have been used (insert). During 967 CE, there were 95.46° between zeta Piscium and the winter solstice. There were 2,320,545 Julian days between 22 / 04 / 967 CE (24:00) and 31 / 12 / 5388 BCE (24:00). This corresponds to 6353.441634 tropical years. It is worth noting again that, according to Burgess, the trepidation (libration) model was probably a shrewdness imagined by later Indian scholars to keep true the assumption of the equality of the tropical and sidereal years. Khmer scholars probably knew precession caused a continuous retrograde motion of the equinoxes. Our hypothesis (that zeta Piscium can be calculated, using the Indian estimate for the rate of precession, to be located at the winter Solstice in 5388 BCE) could be an explanation as to why the Indian name for “precession” (ayanamça) means “solstice”. It is worth noting that between 499 CE, which Aryabhata determined as the end of the first period of 3600 years of the Kali Yuga from its inception at the "primordial super-conjunction" of 3102 BCE, and 967 CE, all the planets gathered in the trepidation zone three times, on 08/04/670, on 08/04/730 and on 05/02/789 CE. However, the event of 967 CE was the only gathering which happened integer multiples of 12 years after 3102 BCE, as well as 79 CE (Saka era) and 499 CE." The role played by the Pleiades (eta Tauri) or Krittika as indicator of the beginning point of the yearly cycle in the primitive calendars from Kam­chatka to the Cape of Good Hope, from Australia to North and South America, is a widely confirmed fact. Actually we cannot make an excep­tion to this seemingly general rule in cultural anthropology for any good reason in the case of the Indus Civilization. As seen from Moenjodaro and Harappa, this heliacal rising was watched, respectively, 32 and 34 days after the equinox (table). According to Syed Mohammad Ashfaque, the seal 2430 from Moenjodaro depicts the heliacal rising of the Pleiades cluster. 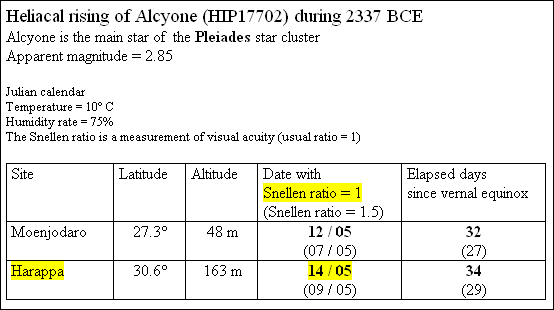 Although it was rather approximate and probably fortuitous, this correlation between the heliacal rising of the Pleiades star cluster, as seen from Indus Valley around 2400 BCE, and the event of 22/04/967 CE would have called the Khmer astronomers' attention. The Nakshatras system (lunar zodiac with 27 or 28 mansions) has indeed, according to Syed Mohammad Ashfaque, a pre-Rig Vedic origin. It is a component of the astronomical knowledge the Aryans learned from the Dravidians (insert). The Pleiades, clearly identified by Professor Ashfaque on the seal 2430, became the "junction star" of the first Nakshatra (Krittika) from 1181 BCE to circa 570 CE. At the latter epoch, the Nakshatra "Asvini" (whose junction star was 13 Arietis) became the first point of the lunar zodiac. It was a late attempt to take into account the precession. So, as far as the Pleiades are concerned, there was probably a cultural continuity between the pre-Rig Vedic and Classical epochs. So far (as) astronomy is concerned, the most likely place where the Aryans learnt the heavenly science from the Dravidians, appears to be the area of the Malwa plateau. This seems to have happened more specifically in the ancient city of Ujjain, whose reputation as a centre of astronomical studies in India from times immemorial is attested from various literary accounts. Ujjain remained the centre of astronomical studies even during the Classical and Medieval periods of ancient Indian astronomy. By virtue of its supposed location just on the meridian linking the Island of Ceylon with the North Pole, it came to be treated as the "Cupola of the Earth" (al- Qubba) by some of the Islamic astronomers and medieval European geographers." B) We discovered that, on 22/04/967 AD at 23:57, Jupiter ran through the ecliptic meridian of the calculated Indian sidereal zero point (calculations in insert). As the same conjunction occured near the equinox of the reference year of 564 CE (insert and link below), we suggest 22/04/967 was a stage of a Jupiter calendar used to measure the precession. Sun was equal to 12 hours on the meridian of Phnom Bok. 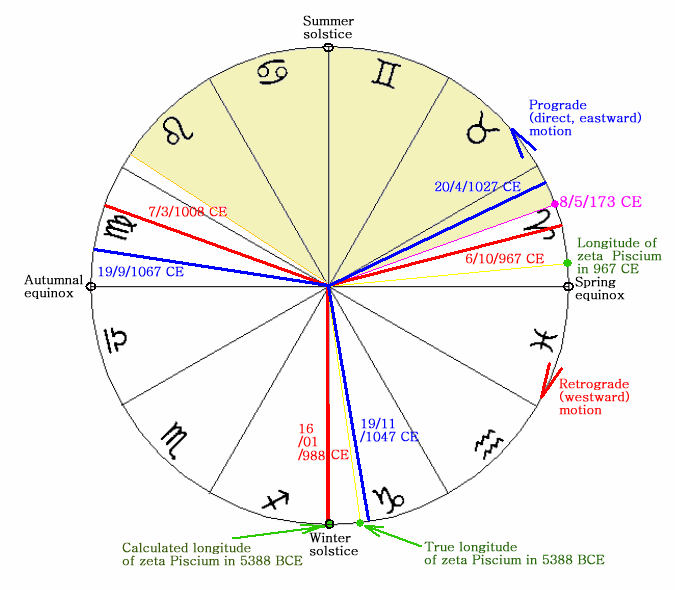 The planets were gathered round the star zeta Piscium which is the initial point of the Indian sidereal zodiac. This was also the case on February 17-18 3102 BCE i.e. on the date which was used as the epoch of reference by the Indian astronomers who established the tables of mean planetary longitudes. More precisely, the five planets were gathered, during the events of 967 CE and 3102 BCE, inside the trepidation zone ie inside the zone (horizontal yellow lines on star maps below) where, according to the explicit model of precession of the Surya Siddhanta, the vernal equinox was oscillating (see insert). The amplitude of the trepidation was nil on 21 / 03 / 499 CE at Noon and on 18 / 02 / 3102 BCE at 00:00 (meridian of Lanka ie the 76th eastern meridian). The sidereal reference point is 10 arcminutes East (ie towards Aries) of zeta Piscium. Despite the fact that it was erroneous, this model provided almost correct stellar longitudes for Vedic and post-Vedic periods (after 1200 BCE). As far as the Kali Yuga’s beginning was concerned, the successive gatherings of the initial points of both zodiacs in the same area was probably a way to keep true the assumption of the equality of the tropical and sidereal years. We’ll see later the more correct “Implicit” model of precession was probably used by the Khmer astronomers to determine the location of equinoxes and solstices during remote epochs. So, the planetary gathering occurred during the second half of April 967, probably on the date of the temple’s consecration. This “opening of the eye” occurred on April 22 (Julian calendar). The date, confirmed by Briggs, is remarkable. It is indeed the date of the Sun’s zenithal culmination in northern Cambodia, i.e. in the central area of the Khmer empire. In the Gregorian calendar, it is 27 / 04 (any year). It is worth remembering that the wet season, the most important moment of the year for the peasantry, is heralded by this zenithal culmination. It is interesting to note that the Khmer empire was large enough to provide a large "bracket" of dates. On the 10th parallel, the Sun culminates at zenith on April 16 (Gregorian). It is May 8 (Gregorian) on the 17th parallel. In CE 967, the corresponding Julian dates were April 11 and May 3. That means the date of consecration was the “mean” date of zenithal culminations for people living between the 10th and 17th parallel. Moreover, it is the date when the Sun crosses the zenith of Koh Ker, an ancient Khmer city which was the “pivot” of the outer planets diagrams. 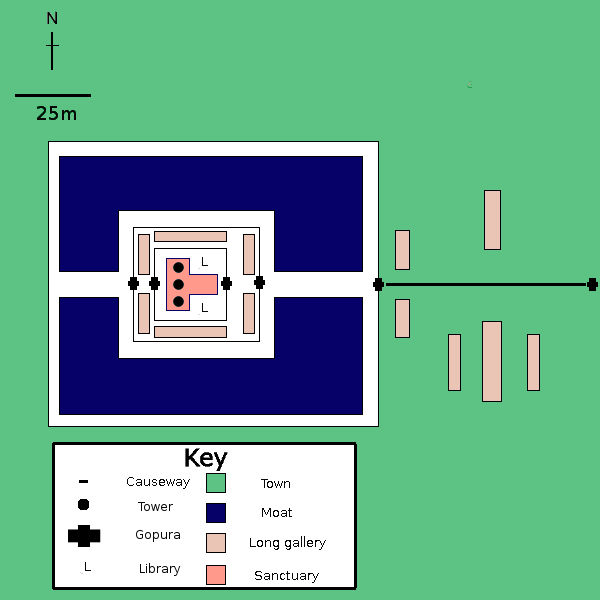 - Koh ker (Sun at zenith on 22/04) was built on a location which played the role of a “hub” in the oldest diagrams (22/04) of the outer planets. - The temple of Phnom Chissor (Sun at zenith on 15/04) was built by Jayavarman I as a component of a later Sun’s diagram (15/04) we mentioned here above about Chau Srei Vibol. We noted that the Khmer name of Phnom Chissor, “Suryaparvata”, means “Mountain of the Sun God”. The event of 15/04/967 and 22/04/967 CE occured respectively 30 and 37 days after the spring equinox. At the dawn of Indian civilization, around 2400 BCE, the astronomers of Harappa and Moenjodaro observed the heliacal rising of the Pleiades star cluster approximately one month after the spring equinox. According to Syed Mohammad Ashfaque ("Astronomy in the Indus valley civilization"), this observation was usual because the the Pleiades were located, during that epoch, near the vernal equinox (insert). Conclusion: the planetary gathering of 967 CE occurred 8 periods of Jupiter-Saturn conjunctions after the alleged crossing of zeta Piscium through the winter solstice. by the planets on 22/04/967 at midnight (24 h). From « CISARK » : carte interactive des sites archéologiques khmers. According to the Surya Siddhanta, the sidereal zero point was located 10’ to the east (prograde) of zeta Piscium. The ecliptic longitude of this zero point was nil during the year 564 CE. The conjunction of Jupiter with the equinoctial Sun on 20/03/564 CE at 03:57 (Lanka) was the origin of the Sassanian astronomical reform. 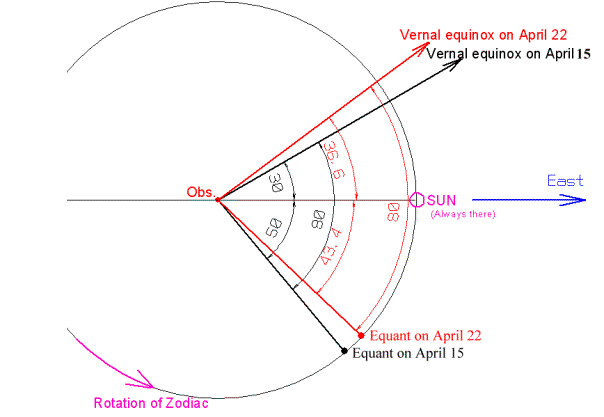 One week earlier (13/03/564 CE at 12:52, Lanka meridian), Jupiter crossed the sidereal zero point. 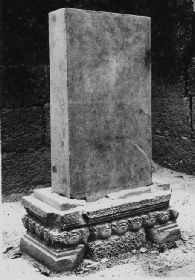 As the event of 967 CE was predicted, the Khmers used most probably the precession rate of the Surya Siddhanta (54 arcseconds per year) to determine the longitude of the sidereal zero point during the latter year. It seems the Khmers calculated the ecliptic longitude of Jupiter with a great accuracy. It is worth noting that, according to the Hellenistic author Anianus, the Greek « Deluge » (upper insert at right) occured 2226 years 23 days and 4 hours after the « Creation » (lower insert at right) ie on 01/02/5328 BCE. It is 60 years after the event described here above. It is 01/02/5328 BCE at 18:05 on Lanka meridian. It is 15 minutes after sunset. We think the Greeks tried to locate the Sun on the solstice of an epoch which was important for some reason. That means the Sun was at 1.97° from the « Indian » zeta Piscium. We suggest the Khmer astronomers believed there was a conjunction of the Sun with zeta Piscium near the winter solstice at the moment of the Greek "Creation". This should have occurred 8 periods of Jupiter-Saturn less 60 years before 22/04/967 CE. Let me summarise my conclusions. After the discovery of trigonometry, tables were calculated by trigonometrical methods. By the aid of these tables, several Hellenistic authors tried to date the deluge by calculating conjunctions of Saturn and Jupiter in the fourth millennium B.C. One of those attempts led to the discovery of an approximate mean conjunction of all planets in 3102 B.C. Next, a new theory and new tables were fabricated, based on the assumption of a mean conjunction of all planets in February of this year, and of an exact repetition of all planetary positions at the end of a certain World-Year. These tables were used, with corrections, in Sassanid Persia. Aryabhata corrected the theory, replacing the Persian world-year of 360000 years by a period twelve times as large. The year when Rahu and Ketu swallowed the Sun over the craddle of Khmer civilization. Most observations described here above could have been noticed anywhere in the Hindu world. On the contrary, a particulary spectacular astronomical event was observed only in the Khmer part of this world during the year 967 CE. 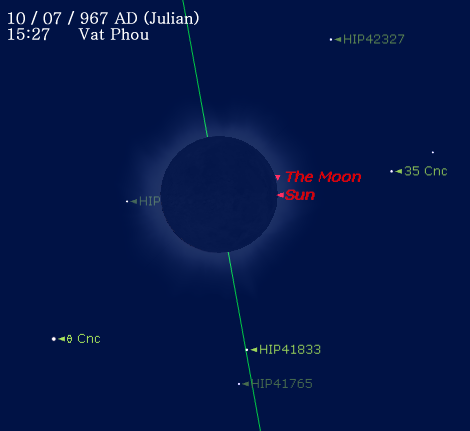 A total eclipse of Sun occured indeed on 10/07/967 CE. The umbra crossed Asia from the Mediterranean Sea to the Pacific Ocean. The line of centrality did not cross Mesopotamia, Persia and India but it ran through the northern part of the Khmer Empire. It crossed, in particular the Vat Phou site, the craddle of the Khmer civilization. According to the Indian mythology, the demons Rahu and Ketu were supposed to swallow the Sun. The chart (to the right) is provided by the "Five Millennium Canon of Solar Eclipses: -1999 to +3000"
The Sun was fully eclipsed at 15:27. It was short (from 15:26:18 to 15:27:26) but the sight before the Khmers' eyes was wonderful : Venus, Mercury, Sirius, Castor, Pollux and Regulus could be watched. On the eastern horizon, Arcturus, Antares, Spica and alpha Centauri were visible. Such a show over the cradle of Khmer civilization was most probably interpreted as a divine sign. We are not sure the Khmer were able to predict that Vat Phou was precisely on the line of centrality but, anyway, the Vat Phou's show has probably convinced the Khmers they were right to use the year 967 AD as a reference for the planetary diagram.